The film, which includes protesters against cops and hijabis in Sapphic passion, seizes eyeballs in its own right, but the print work will cause the real heat. Each features two prominent world leaders mid-smooch: above, you'll find President Obama giving one to Hu Jintao of China. It appeared on the Piazza Duomo in front of the cathedral of Milan. This one showed up on the Sant'Angelo bridge in Rome. 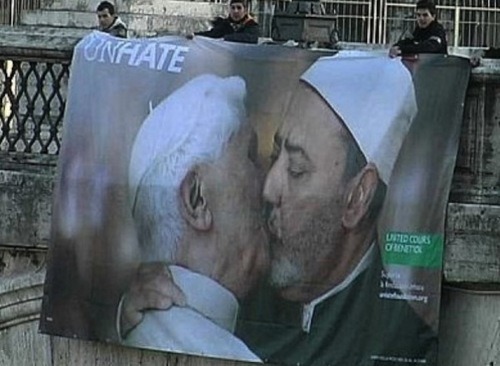 It depicts Pope Benedict XVI cosy-facing Cairo's Imam Ahmed el Tayyeb. 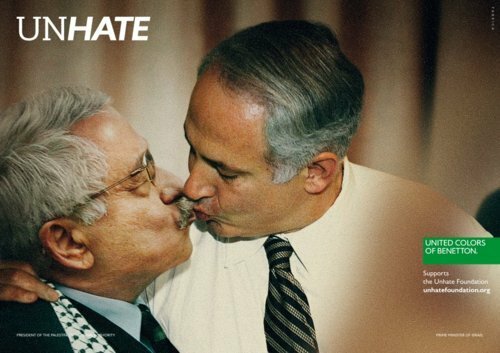 Banners guide people to the Unhate Foundation website, where you'll also find a Kiss Wall. Upload kisses of your own to bring the controversial fun closer to home. See? This is the kind of thing that could use a Facebook app. Otherwise, winning work by 72andSunny Amsterdam; photos courtesy of Claudio Gagliardini and SuchaBlog.